Did you know that four circles make a square? 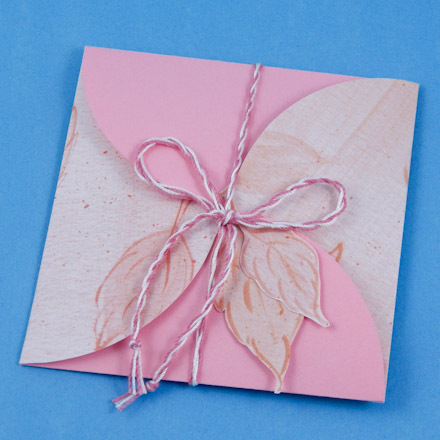 In this project, learn a surprising technique for making square petal envelopes. 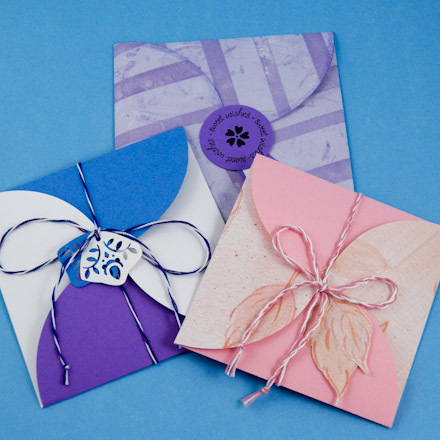 These simple envelopes are inspired by Japanese gift wraps and require little or no adornment. They are great for wrapping flat packages or gift cards. 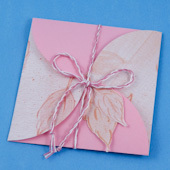 Give your envelopes a Japanese feel by using simple, elegant papers and a twine tie, or maybe some Japanese mizuhiki. 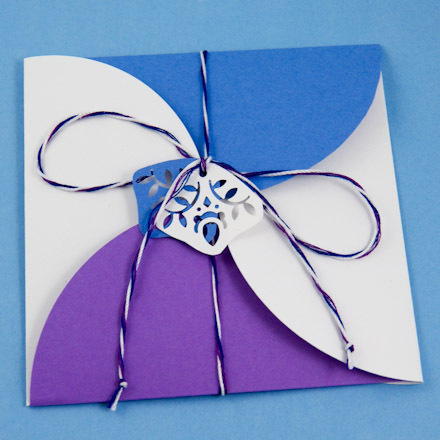 Related craft: For another style of petal envelope with printable patterns, see the Half-Moon Petal Envelope craft project. 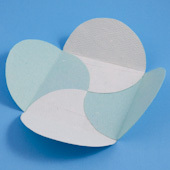 Read through the project and gather the materials needed for making the Square Petal Envelopes. If you are doing this craft with a group, pre-cutting 4" circles from white and colored paper will make the craft go faster. Draw two 4" circles on white paper and two 4" circles on colored paper. You can use a compass to draw the circle, or trace around a small plate or lid that is about 4" across. Tip: A 4" circle makes a 4" square envelope. Make the circles smaller or larger to make smaller or larger envelopes. To fit a specific card size, use circles that are 1/8" (3 mm) larger than the card. For example, use 4 1/8" circles for a 4" square card. Project extra: Download Aunt Annie's printable circles pattern with circle templates in five sizes to make petal envelopes for cards ranging in size from 2" to 4". Cut out the four circles. Tip: It is important that the circles are precisely cut and all the same size. Fold the circles exactly in half and unfold. Stack the circles in a pile of alternating colors. Fan the pile of circles out around a center point with the fold lines forming the sides of a square. Pull the side of the last circle forward to overlap the first circle. You should see a pinwheel shape in the center of the square formed by the overlapping circles. Glue the overlapping edges of the circles together. While firmly holding the circles in place, carefully lift each overlapping edge and apply glue. Repeat on the reverse side. To close the envelope, fold the circles in half again—each in turn around the square. Gently tuck one side of the last circle under the first. The envelope may be tied close with string or ribbon, or it can be sealed with a sticker or medallion. That's it! Your envelope is complete! Tip: Vary the colors of the circles for different looks. Tip: Use patterned paper for two of the circles. 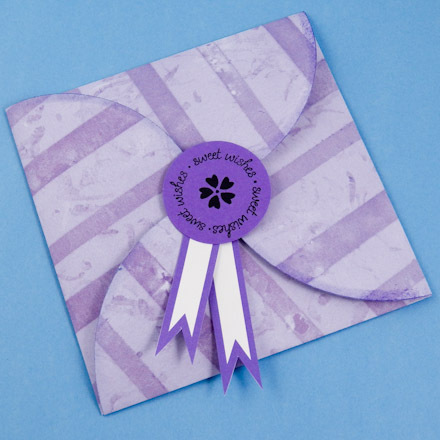 Tip: Seal the envelope with a circle medallion adorned with ribbon. Aunt Annie's Banner Ribbon ePaper is used on this medallion. Tip: Lovely envelopes can be made from handmade paper, especially 2-ply paper with different colors on the two sides. Complete instructions for plying paper are in the How to Ply Handmade Paper craft project.